The new scooter generation by BMW appears urban and modern. The BMW C 600 Sport ✅ is available since 2012 with a 60hp two-cylinder inline engine and 647ccm engine displacement. Moreover, the scooter is characterized by a good handling and stability due to the solid chassis, especially at a higher speed. Space is available as well for this BMW scooter, as the necessary comfort. 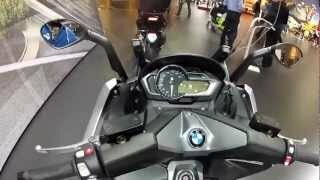 If you want to equip your BMW C 600 Sport with complementary accessories, you find the right products in our shop. To protect the fairing in case of a fall over we recommend the crash protectors for front and rear, supplied in a set of two. To protect the driver against mud and dirt you find excellent mudguards for the BMW C 600 for front and rear made of precious carbon. That looks good and is still stable! For those who are interested in a new silencer can reach for the Remus HexaCone. This exhaust saves 1.5 kg of weight in comparison to original exhaust. The products of the Austrian manufacturer Remus are also characterized by a good processing as well as a great sound.